Tri-County Regional Vocational Technical High School's FIRST Robotics team, Tri-Force Team 3236 has had an excellent year. The high school robotics team participates in the FIRST (For Inspiration and Recognition of Science and Technology) Robotics Competition (FRC). Through work on engineering, design, animation, and development, students are inspired and encouraged to explore the wonders of technology. More importantly, team members gain valuable insight in cooperation and teamwork through intensive activities that encourage members to design solutions with the help of their peers. Robotics as a whole encompasses a broad range of specialties necessary for the functioning of the team. Our members are skilled and specialize in a wide variety of fields. The Tri-Force Team 3236 robotics team is made up of a group of 20 students from skilled and specialized career-focused vocations including electrical, automotive technology, engineering, computer information systems, and medical careers. Through the mentoring, teaching and coaching from Mr. Michael Garland and Mr. Tom Vagnini, the students have been able to succeed in winning competitions all the way to the World Championship in Michigan. The team also has three major sponsors, DoD STEM and TE Connectivity and Tri-County Regional that have helped them to achieve so much this season while supporting them every step of the way. Every year, all of the teams around the world are given a new challenge. This year, the challenge was called Power Up. Teams had to place milk crates on elevated platforms to score points faster than their opponents did. The teams have 6 weeks to build and program a robot out of scratch that can perform a number of the scoring objectives. To be successful the robot had to be able to operate both automatically on its own, and with the help of human drivers. The robot also had to lift objects from the floor up to 8 feet in the air to score the most amount of points. After a 6 week build season, teams go onto competitions where they compete against over 40 other high school robotics teams and robots. 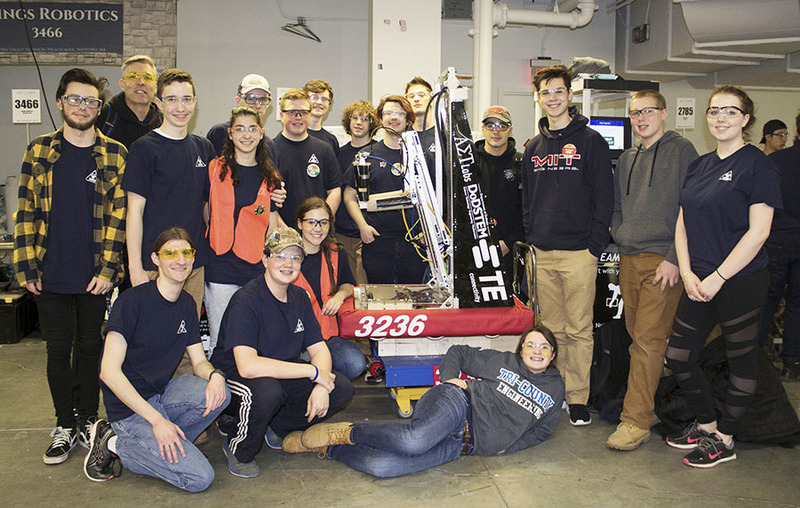 This year, Tri-Force Team 3236 attended events at Worcester Polytechnic Institute and Bryant University to compete for a spot at the New England District Championship. For the first time, the team qualified for both the New England Championship and the World Championship. The WPI event was an excellent start to the competition season. At the end of the qualification round, the team placed 16th out of 41 teams and were selected to be on the 7th seeded alliance. This caused a major upset due to the team beating the 2nd place alliance but losing in the semi-finals at the event. However, Tri-Force Team 3236 did not go home empty handed. Through the hard work of the safety captain, Mike Barba, a junior from Franklin, and the rest of the team, they earned the Safety Award. Mike Barba also moved on as a semi-finalist for the Dean's List Award. The team continued to do well going into the second event at Bryant University. Before the matches began, the students disassembled a section of the robot with hopes of making it better and stronger. This improved design helped to finish the qualification rounds 9th out of 42 teams. In the playoffs, the team was the captain of the 6th seeded alliance and beat the 2nd and 3rd alliances to make it into the finals. They barely lost in the finals to the event winners finishing in 2nd place for the entire event. With the number of points earned for those 2 events, the team qualified for District Championships at Boston University. They ended up in 7th place out of 64 teams overall, and qualified to be a 6th place alliance captain. Tri-Force Team 3236 placed 18th out of 209 teams in New England, and 4th in Massachusetts, allowing them to qualify to be one of the 42 New England teams attending the World Championships in Detroit, Michigan. This year, almost 400 teams were invited to compete at the World Championships. The team competed in the Daly division against 68 teams from all over the world. After 2 days of intense competition, major work, and several design changes to their robot during competition, the team ended up 30th in their division, which was a major accomplishment for their first time at the World Championships. "Each of these students have consistently gone above and beyond to design, build, market, and operate a competitive robot in a business-like environment while supporting the ideals of FIRST," said Michael Garland, Engineering Instructor and Robotics Mentor. "I am so proud of the team's accomplishments and am excited that the students are already preparing and looking forward to the challenge next year."